Model View Controller, or MVC, is a well known architecture for user interface design. This chapter describes how Zen implements MVC, and how to add MVC features to a Zen page. 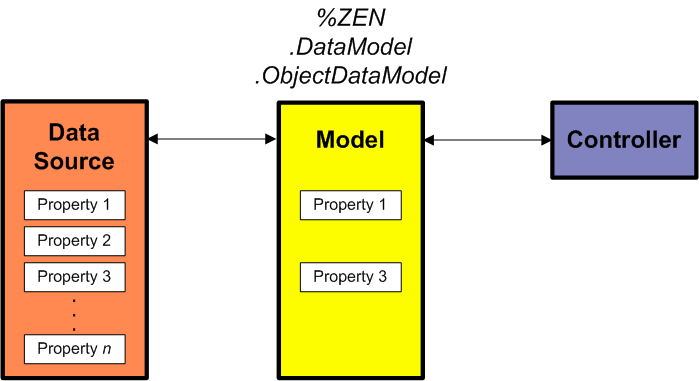 To simplify the flow of data from a data source to a Zen page, Zen provides a set of classes that let you define a data model (the model) and connect it to a set of Zen components (the view) via an intermediate object (the controller). When the model associated with a controller changes, these changes are automatically broadcast to all views connected to the controller. Create a form that displays a set of properties, loaded from a persistent object within the database. The form automatically displays controls appropriate to the data type of each property. Display a chart based on values within a form. The chart automatically updates its display whenever the user submits any changes to the form. Display meters representing values calculated on the server. When the page is refreshed, these meters automatically update themselves with current values from the server. 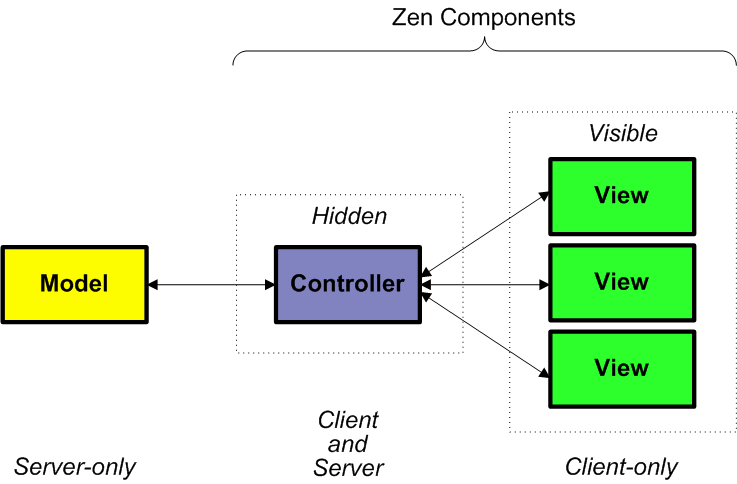 The following figure shows the three parts of the Zen MVC architecture  model, view, and controller  and indicates where these objects execute their code. The controller and its associated views are Zen components, placed on the Zen page. The controller component is hidden from view, but view components are user-visible. The view components display data values, which they obtain by requesting them from the controller. The controller resides on the client, but has the ability to execute code on the server. The model resides entirely on the server. It draws its data values from a source on the server and can respond to requests for data from the controller. Place these values into its own properties. Make these properties available to be consumed by a data controller. There are two variations on a data model class. Typically you choose one of these as your parent class when you create a new data model. The variations are closely related, but serve different purposes. 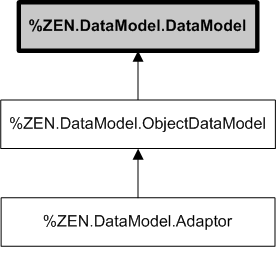 The available data model subclasses are %ZEN.DataModel.ObjectDataModel and %ZEN.DataModel.Adaptor, as shown in the following figure. A subclass of %ZEN.DataModel.ObjectDataModel is called an object data model. It defines one or more properties that a data controller component can consume. Each of these properties is correlated with a value from the data source class. Not every value in the data source needs to be exposed in the model. This convention allows you to expose in the data model only those values that you wish to. An example of this might be a patient record, which contains confidential information that not every application should expose. Keep in mind that when you use this option, the developer of the object data model class is responsible for implementing methods to load values from a source into data model properties, store values back to a source, and validate values. This is in contrast to the adaptor data model, where Zen takes care of these details. However, this is not such a difficult procedure. For code examples, use Studio to view the classes ZENMVC.FormDataModel and ZENMVC.FormDataModel2 in the SAMPLES namespace. There are many times when it is convenient to use a persistent object as a data model. To make this easy to accomplish, Zen provides the %ZEN.DataModel.Adaptor interface. Adding this class as an additional superclass to a persistent class makes it possible to use the persistent class as a data model. This data model makes available to a data controller any and all properties that it contains. This option is useful when you want to expose every property in an existing class. An example of this might be a class that you are using in an inventory or parts control application, wherein each product might be described by a class with a large number of properties. If you want to place all of these properties onto a form automatically without writing another class, you can simply cause the product class to extend %ZEN.DataModel.Adaptor. Following that, Zen simply generates the form for you, as later topics explain. The drawback of this choice is that your data and form are very closely linked. If you want some flexibility, you should subclass the object data model class and implement the internal interface. This is the classic trade-off of convenience versus flexibility. For code examples, use Studio to view the classes ZENMVC.Address and ZENMVC.Person in the SAMPLES namespace. A data controller manages the communication between a data model and a data view. A data controller is any subclass of %ZEN.Auxiliary.dataController. Through class inheritance, every data controller is also a Zen component, as the following figure shows. This convention permits you to place a data controller on a Zen page. To provide a data controller for a Zen page, simply add a <dataController> or a subclass of %ZEN.Auxiliary.dataController inside the <page>. The <dataController> component appears in XData Contents along with other components, but it is not visible onscreen. It acts as an intermediary between a data model and one or more data views. The following example defines a <dataController> that opens an instance of the class MyApp.MyModel using an id value of 1. A <dynaForm> is bound to the <dataController> by setting the <dynaForm> controllerId property to the id of the <dataController>. This causes the <dynaForm> to display a form that provides a Zen control for every property within the modelClass. The id attribute is required for <dataController>. name and condition may also apply. A <dataController> is not visible, so visual style attributes do not apply. If true, the <dataController> displays an alert box when it encounters errors while invoking server-side functions, such as when saving or deleting. The default is true. autoRefresh Setting autoRefresh to a non-zero value turns on automatic refresh mode for this data controller. In this mode, the data controller reloads its data from the server at the periodic interval specified by autoRefresh (in milliseconds). autoRefresh is provided as a convenience for data controller used to drive meters or charts; it is of limited use for forms. Setting autoRefresh to 0 disables automatic refresh mode. defaultSeries Optional. If a data model has multiple data series, defaultSeries is a 1-based number that specifies which series should be used to provide values to data views that can only display values from one data series (such as a form). The default is 1. Package and class name of the data model class that provides data for this <dataController>. The modelClass value can be a literal string, or it can contain a Zen #()# runtime expression. String that identifies a specific instance of a data model object. The form and possible values of the modelId string are determined by the developer of the data model class. The modelId value can be a literal string, or it can contain a Zen #()# runtime expression. If true, this data controller is read-only, regardless of whether or not its corresponding data model is read-only. The default is false. getDataAsArrays() Returns the data in this controller as an array of arrays. This is useful when working with charts. Returns the data in this controller as an instance of a zenProxy object with properties whose names and values correspond to the properties of the current Data Model object. If the data model supports more than one data series, then series (0-based) specifies which series to use (the default is 0). For information about zenProxy, see Zen Proxy Objects in the Zen Pages chapter of Developing Zen Applications. getDataByName(prop) Returns the data in the specified prop (property) of this data controller object. This data is equivalent to the value of the corresponding control on the generated form. Return number of dimensions within the dataModel. There are 2 dimensions: The first is the set of properties, the second has a typical size of 1. The second dimension may be larger than 1 in cases where the model serves multiple series for a given model instance. (Such as when providing multiple data series for charts). getDimSize(dim) Return the number of items in the specified dimension dim. dim is 1,2, or 3.
getLabel(n,dim) Get the label at position n in the given dimension dim. n is a 0based number. dim is 1,2, or 3.
getModelClass() Return the current modelClass value. getModelId() Return the current modelId value. raiseDataChange() Notify listeners that the data associated with this data controller has changed. Change the specified property p of this data controller object to the value v. This also changes the value of the corresponding control on the generated form. If p is "%id" change the id of this controller. If p is "%series" change the defaultSeries of this controller. If the data model supports more than one data series, then s (0-based) specifies which series to use (the default is 0). Following a call (or multiple calls) to setDataByName, you must subsequently call raiseDataChange to notify listeners that the data associated with this data controller has changed. setModelId(id) Change the modelId value at runtime. Changing the modelId value causes the controller to load a new record, and to update its associated views. setModelClass(name) Change the modelClass value at runtime. Optionally, you can call setModelClass(name,id) to change both the modelClass and the modelId. Changing the modelClass value causes the controller to abandon the previous model and load data from the new model into the controller. For an illustration, see the figure Data Controller and Data View Classes in the Data Controller section. A data view component connects to its associated data controller at runtime, and uses it to get and set values from the associated data model. A data view points to its data controller; more than one data view can point to the same data controller. Data view components support the usual Zen component attributes, plus any specialized attributes that are typical of the specific type of component. Additionally, all data view components support the following attributes, which relate specifically to the component’s role as a data view. If a user sets a component’s value by interacting with the Zen page, the controller and thus the model are notified. If program code sets the value, the controller is not notified, and the value is lost on submit. Program code should write directly to the controller, which then updates the control. controllerId Identifies the data controller for this data view (). The controllerId value must match the id value provided for that <dataController> component. If the dataBinding value is a simple property name, this is assumed to be a property within the data model class identified by the <dataController> modelClass attribute. Alternatively, dataBinding can provide a full package, class, and property name. dataBinding is generally suitable for components that display a single value (meters or controls). Each meter on a Zen page must supply a controllerId and a dataBinding. Controls do not support the data view interface, so cannot supply a controllerId, but if the form that contains the controls has an associated data controller, each control within the form can supply a dataBinding attribute that identifies which property it displays. Whenever a user modifies a value within one of the controls that is bound to a data controller, the data controller is notified. It is common for data views to share a controller; for example, different types of chart on the same page could share the same data controller to display different visualizations of the same data, as in the following figure. If there are multiple data view components connected to the same data controller, they are all notified of any change to a bound control. When you change a value in one of these pages by editing it in the <dynaGrid> and pressing Enter, this change affects the corresponding value in all the charts (or meters) on the same page, because all of them share the same data controller. In the following figure, the user has just modified the Trucks field in the <dynaGrid> for ZENMVC.MVCChart. This topic provides the first in a series of exercises that show how to use the Model View Controller to create a form. If you have a new Caché installation, before you begin these exercises you must first run the ZENDemo home page. Loading this page silently generates data records for the SAMPLES namespace. You only need to do this once per Caché installation. An object data model takes more work to code. An object data model gives you explicit control over which properties end up in the model, so it makes more sense for cases when you want to shield certain properties from display or when you want to display charts, which require very fine data control. The choice of adaptor data model is simple and convenient, but it imposes a burden on the original persistent object, in that you must change its class code to allow it to become an adaptor data model. A <form> is a good choice for the key forms that are critical to the success of your application. A <form> requires more work to encode, but provides as fine a level of control as you need to perfect the results. A <dynaForm> provides automatic results and automatically updates its layout if you change the underlying data model. This is useful to generate forms for large volumes of detailed information such as system administration, inventory, or maintenance requests. For this exercise we choose an object data model and a <form>. Suppose a persistent object called Patient contains a patient record. This object may have hundreds of properties. 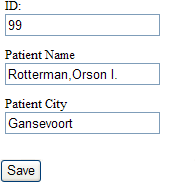 Suppose you want to create a simple page that only displays demographic information, in this case the patient’s name and city of residence. This is a clear case for using %ZEN.DataModel.ObjectDataModel. Click the Caché Class Definition icon. /// Load an instance of a new (unsaved) source object for this DataModel. /// Save instance of associated source object. /// Load an instance of the source object for this DataModel. /// Delete instance of associated source object. /// Do the actual work of loading values from the source object. /// Do the actual work of storing values into the source object. This exercise creates a data controller based on the object data model from the previous exercise, Constructing a Model. It then binds a form to this data controller. Creating a Zen Application  Create the class MyApp.MyNewApp. id is the unique identifier of the data controller on the Zen page. A data view (such as a form) specifies its data controller using this id. modelClass is package and class name of the data model class. The previous exercise, Constructing a Model, created the class MyApp.PatientModel which is an object data model that represents objects of the ZENDemo.Data.Patient class. modelId is a number that identifies the record to initially load from the data source. In this case, it is the identifier of a specific ZENDemo.Data.Patient object. The <dataController> component is not visible on the page. Place a <form> component inside the <page> container. The id attribute does not affect the binding but becomes useful in a future step, when we save the form. Within the <form> add two <text> controls. The label attribute does not have any purpose relative to the Model View Controller, but it is necessary if we want our controls to have a meaningful labels on the Zen page. Open your Zen page class in Studio. The data controller component creates a MyApp.PatientModel object on the server, and asks it to load data from data source record number 1 (identified by the <dataController> modelId attribute) into its own properties. The data controller places these data values into the appropriate controls within the form. The dataBinding attribute for each control identifies which property provides the value for that control, Name or City. The following figure shows our form with the current values from record 1. Add to your page a <button> that calls this method to save the form. Try editing the data and clicking Save. Each time the user clicks the Save button, the form save method calls back to the server and saves the data by calling the appropriate methods of the data model class. During this process, the form asks the data controller to assist with data validation of the various properties. The source of this validation logic is the data model class. The data controller also has a save method we can use. There is a difference between saving the form and saving the controller. Calling the save method of the form triggers the form validation logic, after which the form instructs the controller to save data by calling the appropriate methods of the data model class. Saving the controller skips form validation. You can try out basic form validation in step 3 of this example as follows: If you empty the Patient Name field entirely and click Save, a validation error occurs. This is because the Patient property is marked as Required in the ZENDemo.Data.Patient class that serves as our data source. 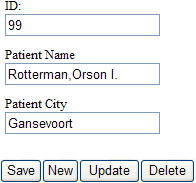 However, if you change the Patient Name or Patient City to any non-empty value, the form saves correctly. It is easier to prove this to yourself once you have extended the form to allow you to easily view more than one data record. Then you can switch back and forth between records to see that they in fact contain your changes. Where 57772 is the web server port number that you have assigned to Caché. 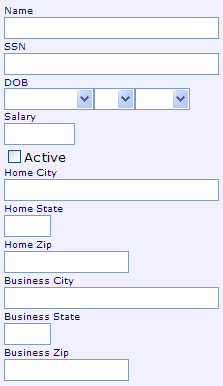 Edit values in one of the forms shown on the page, and click a Submit button. You can use Studio to view the class code. In order to set data values programmatically, set the value in the controller and then tell the controller to notify all of its views of the change. To set the value, you can use the controller method setDataByName, and then use raiseDataChange to notify the views. You have to call raiseDataChange explicitly, which allows you to change multiple values in the controller and only raise the event once. The %ZEN.Auxiliary.dataController class offers several useful methods. Suppose you want to enhance your page from the previous exercise, Binding a <form> to an Object Data Model, so that it can open new records, create new records, delete existent records, or reset the current record to a particular model ID. This topic explain how to accomplish these tasks using dataController methods such as getModelId and setModelId. When you ask the browser to display the page you have been building during these exercises, it always displays the same data record. This is because you have configured the modelId property of your <dataController> element with the value of 1. You can see what happens if you change this property to other values, such as 2, 3, or 4, up to 1000. However, you must remember that these values represent real ID values of existing instances of the ZENDemo.Data.Patient class. These instances exist because all of the classes in ZENDemo.Data are populated automatically when you first run The Zen Demo as described in the Introducing Zen chapter of Using Zen. The onblur event calls a client-side method loadRecord that first gets a pointer to the data controller using its id value "patientData", then uses whatever the user has entered in the <text> field as a modelId to load the desired record from the data model. To actually load the record, loadRecord uses the data controller method setModelId. Also observe that this example binds the ID field to the %id property of the data model, so that this field always shows you the ID of the current record. This step is not necessary for setModelId to work, but it is very useful in Step 2: Creating and Deleting Records in this exercise. The following figure shows the form. Enter 2 (or any other number) in the ID field. Press the Tab key to move out of the ID field. The alternate record should display. Note the number of the current record. Make a significant change to the Name or City field. Enter a different number in the ID field. Enter the number for the record that you saved in the ID field. Your saved changes should be visible on the form. Creating and deleting records are also simple tasks. Modify your page to add the necessary buttons and client side code as follows. These statements add the buttons to an <hgroup> so that they appear on the screen in a row. Each button defines its onclick method as a different client-side method. Each of these methods uses a different dataController method to achieve its purposes. Suppose the user clicks New. Calling createNewObject immediately creates a new empty model. In the browser, every time the user clicks New the form is emptied. 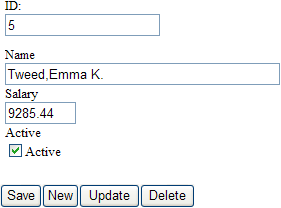 After that, if the user completes the empty form and clicks Save, this invokes the form’s save method. This (eventually) leads to a call to the data model’s %OnSaveSource method on the server. As a result, every time the user clicks New, enters values, then clicks Save, the form shows the newly assigned ID to the user (thanks to the dataBinding on that field). Of course, this only works if the data entered in the form passes validation. 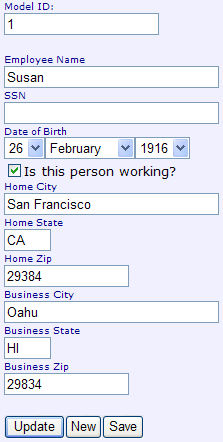 Name is a required field, so if no Name is entered, the record is not saved. Suppose the user clicks Delete. The data controller’s deleteId method expects to receive an input argument containing the ID for the record to be deleted. Therefore, when the user clicks Delete, the page uses the data controller’s getModelId method to determine the ID of the record the user is currently viewing. It passes this ID on to deleteId. This (eventually) leads to a call to the data model’s %OnDeleteSource method on the server. The source object is deleted, and since there is no longer source object, the page calls the data controller’s createNewObject method to empty the form and prepare it for new input. Although the code examples in this chapter do not take advantage of this feature, the deleteId method returns a Boolean value, true or false. It is true if it successfully deleted the record. It is false if it failed, or if the data controller or its data model are read-only. A data controller is read-only if its readOnly attribute is set to 1 (true). A data model is read-only if its class parameter is set to 1 (true). If, while using this exercise, you delete a record with a specific ID, this object no longer exists. You cannot view or create a record with this ID again. 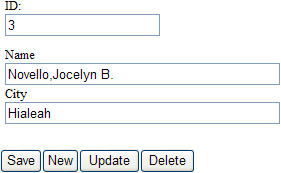 Before clicking Update, the user must enter an ID number (between 1 and 1000) in the ID field. 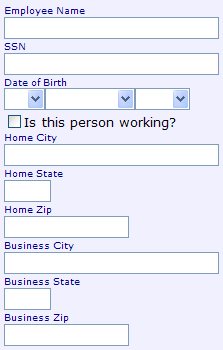 The page updates the form fields with data from that record. This fails only if you have previously deleted a record with that ID. This topic explains how to use <dynaForm> with a data controller. In this case the data model is an object data model. Create a new Zen page class. Use the instructions from the exercise Creating a Zen Page in the Zen Tutorial chapter of Using Zen. Call your new class anything you like, but keep it in the MyApp package. Be careful not to overwrite any of your previous work. The form displays two fields that contain the current Name and City values for the record whose modelId you entered in the <dataController> statement. Perhaps you have changed these values, or deleted this record, during previous exercises. Whatever data is now available for that modelId displays. The label for each control is determined by the corresponding property name in MyApp.PatientModel. These labels are different from the text you assigned to the caption attribute when you used <form> and <text> components to lay out the form. In all other respects, this display is identical to the display you first saw in the exercise Binding a <form> to an Object Data Model, during Step 3: Initial Results. Later steps show how to set specific labels for the controls in a <dynaForm>. In Studio, return to your existing sample page, MyApp.MyNewPage. controllerId identifies the data controller. defaultGroupId identifies the group, on the form, that contains the controls generated by that data controller. defaultGroupId is optional; but if it appears in the <dynaGroup> then somewhere inside the <dynaForm>, you must specify a group with an id that matches the defaultGroupId, in this case a <vgroup>. If you want controls to appear on the form that do not depend on the data controller, such as the control whose value is based on the %id variable, you must place them explicitly, as shown. In Studio, open the object data model class, MyApp.PatientModel. Choose Build > Compile or Ctrl-F7 or the icon to compile the data model. Refresh your Zen page MyApp.MyNewPage in the browser. Your <dynaForm> and <form> now produce identical results. When you use <dynaForm> instead of <form>, it is no longer necessary to add data view components (controls) to the form, item by item, as described in the section Binding a <form> to an Object Data Model. <dynaForm> automatically extracts this information from the data model at compile time. Return to Studio in the SAMPLES namespace. Choose Tools > Copy Class. Select the Replace Instances of Class Name check box. The new class definition for MyApp.EmployeeModel displays in Studio. The new class definition for MyApp.MyOtherPage displays in Studio. Take a shortcut by leaving the <dataController> id as "patientData". You may ignore this shortcut by globally replacing "patientData" with a more meaningful id, for example "employeeData". However, make sure you change all the instances of this id string in the class to avoid errors at runtime. Change the <dataController> modelClass to "MyApp.EmployeeModel". The following figure shows the resulting form, with the values for record 5. <dynaForm> determines which type of control to assign to each property in the model based on the data type of that property. The following table match property data types with the <dynaForm> controls they generate. Most of the data types listed in the previous table are defined as Caché classes. As such, they can define class parameters, including the VALUELIST, DISPLAYLIST, and MAXLEN parameters mentioned in the table. These parameters provide details about the data type. For %Enumerated properties, the VALUELIST parameter specifies the internal values (1, 2, 3) and the DISPLAYLIST parameter specifies the names that are displayed for the user to choose (High, Medium, Low). For %String properties, the MAXLEN parameter specifies a maximum length. Many other class parameters are available. For details, see the Parameters section in the Data Types chapter of Using Caché Objects. For a property whose data type is %ListOfDataTypes, Zen streams the list collection to the client as one string delimited by carriage return characters. The resulting <textarea> control displays one collection item per line of text. For details, see Data Model Property Parameters in the Data Model Classes section of this chapter. For a <form>, this convention works when you bind a <textarea> control to the property of type %ListOfDataTypes using the dataBinding attribute. Where : is a single colon and [CR] represents a single carriage return character. This topic explains how to use <dynaForm> with a data controller when the data model is an adaptor data model. This approach is particularly convenient when you have an existing class with a large number of properties that you need to display on a form. In that case it would be extremely time-consuming to add these properties one by one to a subclass of %ZEN.DataModel.ObjectDataModel, as demonstrated in the previous exercises in this chapter. <dynaForm> can save coding time, especially when you use it in combination with a subclass of %ZEN.DataModel.Adaptor. All you need to do then is to create a Zen page class whose <page> contains a <dataController> and a <dynaForm>. 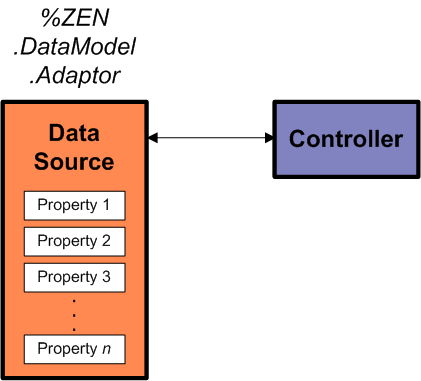 Your subclass of %ZEN.DataModel.Adaptor becomes the model, the view, and the controller, all in one. All of its properties become controls on the resulting <dynaForm>. Zen generates the appropriate control type for property automatically. This example is based on the Zen classes ZENMVC.MVCDynaForm, ZENMVC.Person, and ZENMVC.Address in the SAMPLES namespace. Compile both data model classes. Compile the Zen page class. For a table that matches data types with the <dynaForm> controls they generate, see the <dynaForm> Controls Based on Data Types table in this chapter. Open the data model class Person from Step 1: Generating the Form in this exercise. Refresh your view of the Zen page class in the browser. ZENATTRS applies the specified attribute(s) and value(s) to the generated control. ZENHIDDEN hides the control associated with that property. ZENLABEL replaces the default label (the property name) with a custom string. ZENREADONLY displays the control but prevents the user from editing its contents. <text label="Model ID:" id="idText" dataBinding="%id"
Enter data in the fields (except the Model ID and the read-only SSN field) and click Save. Click the New button again, just to clear the fields. Since you have provided no special format for model ID values in the Person class, the default prevails. This means each new record you add gets a sequential number starting at 1. You may add more records by repeating steps 6 and 7. The numbers increment automatically. If you try to view a record by entering an ID number that does not exist, the <dynaForm> displays with all of its fields disabled. You may click New to redisplay an active form in which to enter data for a new record. If you want to interject changes in a data model before using it, you can override the %OnGetPropertyInfo method in the data model class. This is the way to add virtual properties that you want to use in the model, but that do not exist in the class that you began with. In order to use virtual properties, you must ensure that the data model class parameter DYNAMICPROPERTIES is set to 1 (true). Its default value in the %ZEN.DataModel.Adaptor class is 0 (false). You can use %OnGetPropertyInfo with either type of data model, but it makes the most sense for an adaptor data model because in that case you are using an existing class as a data model. Open the Person class in Studio. Select %OnGetPropertyInfo and click OK. Studio adds a skeleton %OnGetPropertyInfo method to the class. These statements add a <checkbox> and a <textarea> to any <dynaForm> generated by the model. #; Increment past the 3 embedded properties from the last Address object. #; is a simple data type such as %String or %Boolean or %Numeric. Set pInfo("Extra","label") = "This is an extra checkbox." Set pInfo("Comments","caption") = "Please enter additional comments:"
The data model class serves as a wrapper for an independent data source. The data model object provides the interface and the source object (or objects) provide the actual data. In this case the data model class must implement the additional callback methods related to the data source object. Our form examples followed this convention by subclassing %ZEN.DataModel.ObjectDataModel and overriding several server-side callback methods. The data model class is also the data source object. The data model object provides both the data and the interface. In this case, there is no need to override the callback methods related to the data source object. All you need to do is to make your data source class implement the %ZEN.DataModel.Adaptor interface. Then you can use the resulting class directly as the modelClass for the <dataController> component in your page class. For examples, see Adding Behavior to the <form> in this chapter. Data model classes provide class parameters that determine the type of data model. The following table lists them. DOMAIN Available for subclasses of %ZEN.DataModel.ObjectDataModel only. You must provide a value for this parameter if you wish to use Zen localization. READONLYMODEL 1 (true) or 0 (false). If true, indicates that this is a read-only model. It can be used to display data but not to generate editable forms. The default is 0 (false). The %ZEN.DataModel.ObjectDataModel class provides property parameters that you can apply to the data model properties that you wish to use as controls on a form. These parameters let you provide more specific control over the properties of the data model class. 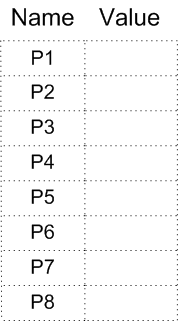 The utility class %ZEN.DataModel.objectModelParameters defines these parameters; the following table lists them. For examples, use Studio to view the classes ZENMVC.FormDataModel and ZENMVC.FormDataModel2 in the SAMPLES namespace. Also see the exercise <dynaForm> with an Adaptor Data Model in this chapter. Type of control used to display this property within a form; If not defined, Zen chooses the control type based on the data type of the property. ZENDISPLAYCOLUMN If defined, this is the name of the column used to provide a display value for SQL statements automatically generated for this property. ZENGROUP The id of a group component that the control used for this property should be added to. This provides a way to control layout. If not defined, the control is added directly to the form. ZENHIDDEN 1 (true) or 0 (false). If true, indicates that this is a hidden field. When the value of this field is sent to the client, it is not displayed. The default is 0 (false). ZENLABEL Label used for this property within a form. The label text cannot contain the comma (,) character, because it is added to a comma-delimited list of labels. ZENREADONLY 1 (true) or 0 (false). If true, this is a read-only field and cannot be edited by the user. The default for is 0 (false). ZENSIZE The ZENSIZE parameter provides a value for the size property of a control, if the control has one. The interpretation of size depends on the HTML element created by the control. For example, for a text control, size is proportional to the number of characters displayed. This behavior is defined by HTML, not Zen. ZENTAB A positive integer. If specified, this overrides the (1based) default tab order of the control used to display the property within a form. All controls with ZENTAB specified are placed before controls that do not define it. ZENTITLE Optional popup title string displayed for this property within a form. If you are using a <dynaForm> with a data model, this concept applies to any property whose data type uses VALUELIST and DISPLAYLIST class parameters, for example a property of type %Enumerated. For a table that matches data types with the <dynaForm> controls they generate, see the <dynaForm> Controls Based on Data Types table earlier in this chapter. These controls (or in the case of <dynaForm>, the controls that Zen automatically generates to represent these properties) show their display lists on the client. The data model always converts values to the display format before sending them to the client. If the Zen application is not localized, the client-side value list and display list are both the same: they are identical to the server-side display list. Any client-side logic for this control must expect these values. If the Zen application is localized into multiple languages, and if the data model class correctly defines the DOMAIN class parameter, then the conventions are a bit different. The client-side value list is still the same as the server-side display list, but now the client-side display list consists of the server-side display values in the local language. Any client-side logic for this control must expect these values. For more about localization, the DOMAIN parameter, and $$$Text macros, see the Zen Localization chapter in Developing Zen Applications. %OnDeleteModel  The data model is deleted. This method is implemented by the subclasses of the data model class, if they exist. %OnDeleteSource Yes The data model is deleted. If implemented, it is responsible for deleting the object that has the given id and returning the status code resulting from that operation. %OnGetPropertyInfo  The %GetPropertyInfo method invokes it. See the discussion following this table. %OnInvokeAction  A user-defined, named action is invoked on this model object. See the discussion following this table. This method is implemented by the subclasses of the data model class, if they exist. %OnLoadModel Yes Zen does the actual work of loading values from the data source into the data model object. The only data to load is the data that is actually seen by the user. This is the place to perform any aggregation or other operations on the data before storing it. %OnNewSource Yes A data model needs a new instance. If implemented, it opens a new (unsaved) instance of the data source object used by the data model, and return its reference. %OnSaveSource Yes The data model is saved. If implemented, it is responsible for saving changes to the data source. It saves the given source object and return the status code resulting from that operation. Before returning the status code, it sets the data model’s %id property to the identifier for the source object. %OnStoreModel Yes Zen does the actual work of copying values from the data model to the data source. This method loads data from the model (probably changed by the user through a form) back into the source object. %OnSubmit  A form connected to this data model is submitted. The contents of this data model are filled in from the submitted values before this callback is invoked. Implementing this callback is optional. When a data controller needs to find information about the properties within a data model, it calls the data model’s %GetPropertyInfo method. This returns a multidimensional array containing details about the properties of the data model. The code that assembles this information is automatically generated based on the properties, property types, and property parameters of the data model class. A data model class can modify the property information returned by %GetPropertyInfo by overriding the %OnGetPropertyInfo callback method. %GetPropertyInfo invokes the %OnGetPropertyInfo immediately before it returns the property information. %OnGetPropertyInfo receives, by reference, the multidimensional array containing the property information. %OnGetPropertyInfo can modify the contents of this array as it sees fit. Properties can be added, removed, or have their attributes changed. Attributes that you add using this method are called virtual properties. In order to use virtual properties, you must ensure that the data model class parameter DYNAMICPROPERTIES is set to 1 (true). pIndex is the index number that should be used to add the next property to the list. pInfo is a multidimensional array containing information about the properties of this data model. If pExtended is true, then complete information about the properties should be returned; if false, then only property names need be returned (applications can simply ignore this). pModelId a string that identifies the currently active instance of the data model object, also known as the model ID. This is provided for cases where the contents of a dynamic form may vary by instance of the data model object. The exact form and possible values of the model ID are up to the developer of a specific data model class. If this is an embedded property, pContainer is the name of the property that contains it. The %type subnode identifies the name of the Zen control that should be used for properties of this type when using a dynamic form. Note that this name is the class name of a component. If no package name is provided, it is assumed that this is a component in the %ZEN.Component package. Use a full class name if you wish to specify a component from a different package. The %group subnode indicates the id of a group component contained by a dynamic form. If %group is specified and there is a group with this id, then the control for this property is created within this group. This provides a way to control the layout of controls within a dynamic form. Attributes that do not start with a % specify values that should be applied to a property of the control with the same name. For example, the following statement causes a dynamic form to set the label property of the control used for the MyProp property to "My Label". Set pInfo("MyProp","label") = "This is an extra field!" Creates an initial list of controls based on the data model properties and their parameters. Modifies this list of controls by calling the data model’s %OnGetPropertyInfo method, if present. Further modifies this list of controls by calling the data controller’s %OnGetPropertyInfo method, if present. This, in turn, invokes the server-side %OnInvokeAction callback of the data model, passing it the name of the action and the data value. The interpretation of the action name and data is up to the application developer. The basic data model object consists of a series of name-value pairs. The name-value pairs in the data model comprise all of the properties in the data model class, minus those properties marked ZENHIDDEN, plus any properties added by %OnGetPropertyInfo, minus any properties deleted by %OnGetProperty. By default, the number of series is 1, but it could be larger. If there are multiple series in the model, conceptually it becomes a matrix. You can add multiple series to the model if you write your own %OnLoadModel method, as in the SAMPLES class ZENMVC.ChartDataModel2, shown below. 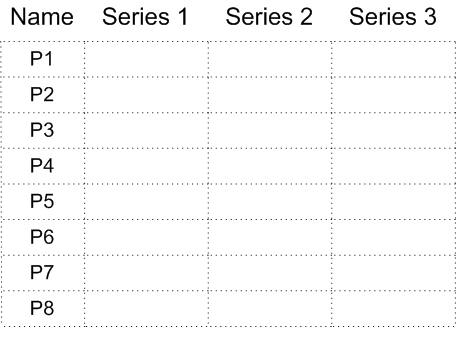 This example creates three series for the model and assigns values to data model properties in each of the series. #; This model has multiple data series. We set up the data series here. #; Now we provide data for each property within each series. #; We use the %data array so that we can address multiple series. When your data model has multiple series, if you bind the data model to a chart, the chart automatically picks up the various series, although you need to be careful with a pie chart. Series work similarly for a grid. A form can only display one series at a time, so you need to rely on the data controller attribute defaultSeries to determine which series is currently in view. %ZEN.DataModel.ObjectDataModel or %ZEN.DataModel.Adaptor are sufficient for most needs. However, sometimes a developer might want to create a special category of data model, for example to represent a global. In that case the developer must subclass %ZEN.DataModel.DataModel and implement the details of this subclass. The following table lists methods that applications can call in order to work with a data model object. The behavior of these methods is up to the specific %ZEN.DataModel.DataModel subclass that implements them. %DeleteModel Delete an instance of a data model object given an identifier value. This takes the given identifier value and uses it to delete an instance of a source object (if applicable). (If the data model object serves as both interface and data source, then the data model object itself is deleted). %OpenModel Open an instance of a data model object given an identifier value. This takes the given identifier value and uses it to find an instance of a source object (if applicable) and then copies the appropriate values of the source object into the properties of the data model object. (If the data model object serves as both interface and data source, then this copying is not carried out). %SaveModel Save an instance of a data model object. This copies the properties of the data model object back to the appropriate source object (if applicable) and then asks the source object to save itself. (If the data model object serves as both interface and data source, then the data model itself is saved. ).